Number one workers compensation injury during winter. The number one worker’s compensation injury during the winter is slipping and falling on ice. 29-37% of all worker’s compensation claims are related to slipping and falling on ice; the number fluctuates based on which state you live in. Falls sustained from slippery ice can cause minor injuries, but can also cause major injuries leading to lost time claims. Nearly 15% of all accidental deaths are caused by slipping and falling on ice. Worker’s compensation claims can be filed from an employee falling in the parking lot, not just within the building. 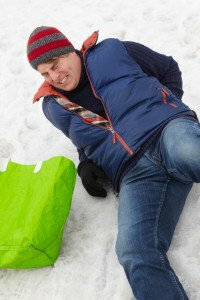 When Can You File a Worker’s Compensation Claim for Slipping on the Ice? If you perform a task that is work-related and sustain an injury from falling on the ice, you can submit a worker’s compensation claim. If you fall while on the premises, including the sidewalks and parking lots, you can submit a claim. This includes break times, and when you are off the clock (walking to or from the building and your car). If you are on-site, traveling for work, or running a special errand for the company and fall on the ice, this too can merit a worker’s compensation claim. When Can You NOT File a Worker’s Compensation Claim for Slipping on the Ice? There are times when your slip or fall may not be covered under worker’s compensation. If you left the building for lunch and slipped at the restaurant, that will not be covered through worker’s comp. If you are attending a voluntary event, like a company holiday party and you fall, that also will not be covered through worker’s compensation. While most injuries incurred while traveling for work are covered, if you participate in an optional activity, like going out to dinner after work some evening, and get injured, they most likely will not be covered. Also, if you fall or slip while commuting to or from work, that probably will not be covered under worker’s compensation. The best thing you can do for yourself is to try to prevent falls in the first place. Wear practical footwear like high-traction winter boots outside and walk slower to minimize slipping. If you can’t wear boots in the office, bring a pair of shoes to change into once you reach the safety of indoors. Talk to your workplace about properly shoveling and salting the walkways to and from the office.